Home » Trending Now » Why is Mike Bibby trending? Why is Mike Bibby trending? Looks like basketball point guard Mike Bibby has made a decision to join Miami where he could see significant playing minutes. Bibby gave up $6.2 million salary in the 2011-2012 season as part of the buyout so that he could pursue a championship this year. 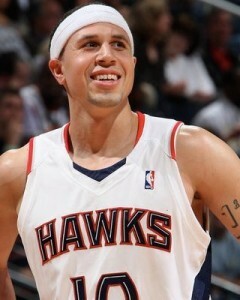 Michael “Mike” Bibby (born May 13, 1978, in Cherry Hill, New Jersey) is an American professional basketball player. He is a 6’2″ point guard and he attended Shadow Mountain High School in Phoenix, Arizona. He is the son of former NBA player Henry Bibby and Virginia Bibby.